Canada’s largest media company teamed up with the oil giant to produce a series of features that showcase how Shell is tackling energy challenges and environmental responsibility. The full-page, feel-good features ran in six Canwest dailies—the National Post, Montreal Gazette, Ottawa Citizen, Calgary Herald, Edmonton Journal and Vancouver Sun—six Saturdays in a row in January and February 2010. The six-part series also appeared in the Toronto Star as a pullout section. The series profiles friendly Shell employees who share what motivates them to work in Alberta’s oil sands—Canwest style is to avoid the use of “tar sands”—otherwise known as one of the world’s largest and most destructive industrial projects. There’s the climate change expert (a goateed grandpa clutching walking sticks), the chemist (a longhaired family man who dabbles in acting) and the environmental management systems coordinator (a young woman in a Cowichan sweater who spent countless hours as a child flipping through National Geographic). The features include “myth busters” to clear up so-called misconceptions like the idea that Shell’s oil sands production is too energy-intensive, pollutes the Athabasca River and results in “dirty oil,” among other allegedly tarnishing falsehoods. The only myth, however, is that these features are editorial content. The fact is, they’re paid advertisements for Shell. While advertorials designed to look like newspaper stories are common, they are usually clearly identified as advertisements as urged by regulatory groups like Advertising Standards Canada. This is essential so readers don’t think the material is subject to the same standards and ethics of journalistic stories: accuracy, objectivity, impartiality, fairness and accountability. Advertorials are often distinguished from editorial copy by not placing a byline on the piece. But in this case, Alberta-based freelancers and Canwest contributors Brian Burton and Shannon Sutherland were credited. 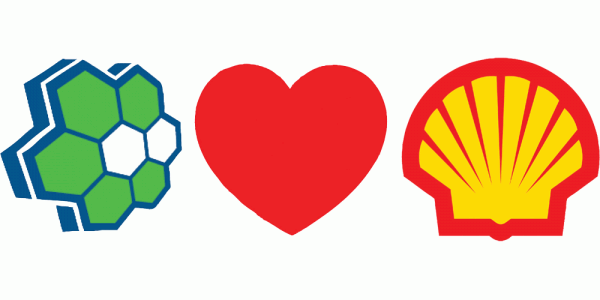 Both Burton and Sutherland have covered Shell and the oil industry for Canwest. Burton has 20 years of experience in corporate communications for leading energy corporations, according to his LinkedIn profile, which also states his goal: “to advocate successfully for my clients in the court of public opinion.” For Sutherland’s part, her bio on one magazine site says when she’s not “interrogating industrialists” she’s hanging out with her kids. When Sierra Club Executive Director John Bennett spotted the features in the Ottawa Citizen, the former newspaper reporter and ad sales rep was shocked by the one-sided nature of the information. “I could not tell they were ads,” Bennett says. “They looked and read like editorial content.” He only learned the features were ads when he contacted the publisher of the Citizen to complain about the unbalanced coverage. The nonprofit environmental advocacy organization promptly filed a complaint with Advertising Standards Canada. However, because Sierra Club went public by issuing a news release, ASC did not accept the complaint: it’s against the rules for special interest groups to generate publicity for their cause through the complaint process. Sierra Club also filed a complaint with the Ontario Press Council, which has not yet adjudicated the matter. The council’s advertising policy states ads that look like ordinary news stories should be clearly labelled as advertising. Despite dismissing the complaint, ASC Vice-President of Standards Janet Feasby says advertising designed to look like news stories is of growing concern and ASC will be publishing an advisory on the subject to bring the issue to the attention of advertisers, media, and the public. Feasby points to a recent precedent decision, in which the ASC found a “special information supplement” in a newspaper that extolled the virtues of Neuragen, a homeopathic product, was presented in a manner that concealed the advertiser’s commercial intent. 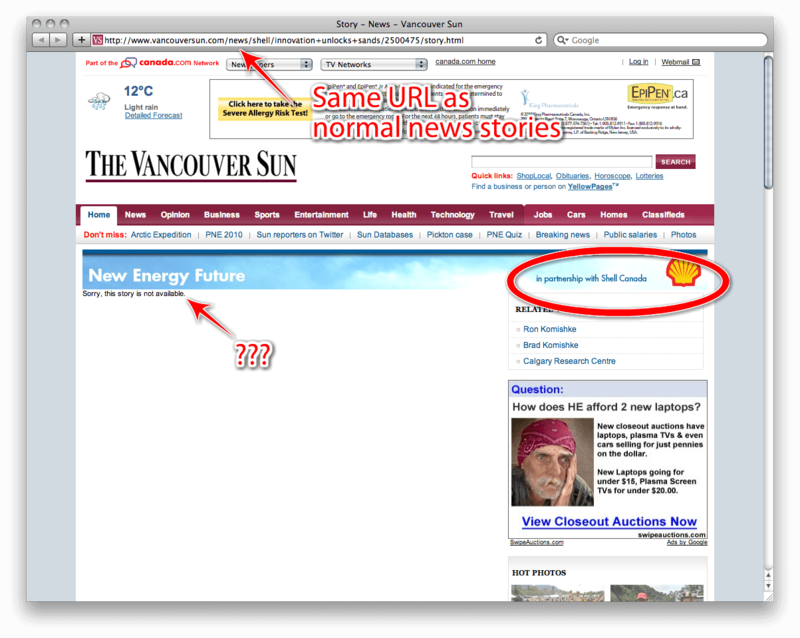 “It was clear to council that it was advertising, not information.” Like the Shell features, an ad for the company was included at the bottom of the page. The seriousness of this matter is magnified when the subject of the advertorial is a controversial one, such as climate change. “[These ads] play on public complacency, they play on the public’s hopes that the environment is being protected,” explained the Sierra Club’s Bennett. “One of the reasons we have so much difficulty advancing the environmental agenda in the face of overwhelming public support is because people can’t imagine there are governments or companies not trying to do the best they can. When you get misleading advertising like this, you play to that inborn need for people to believe that things are being looked after.” You also play into the inborn need people have to trust the media to provide them with honest coverage. While Shell insists it produced the features to clear up “misconceptions” about climate change and its environmental commitment, the company has a track record for producing misleading, greenwashed advertising. In 2008, the Advertising Standards Authority in the U.K. denounced a Shell newspaper ad that described tar sands projects as sustainable, saying it breached rules on substantiation, truthfulness, and environmental claims. A year earlier, the ASA found another Shell ad guilty of greenwashing—this one featuring refinery chimneys emitting flowers. Still, Shell defends its ads. “We were getting feedback from Canadians that all they were seeing and hearing was one-sided information [about climate change], so [the feature campaign] was done to try to balance the discussion,” said Greenberg. “Don’t you think that’s fair?” Readers? Stop Everything #16: Industry seldom changes itself. It's up to us.